If you are coder, you will accept that 80% of the execution time is taken by roughly 20% of the code. Also 80% of the total comments are from 20% of the total articles. 80% of the recognition you get is for a small amount of work (20%) that you do. 80% of sexual satisfaction comes out of 20% of total time spent. Most of our worries (80%) are a result of small number of problems (20%). 80% of the Assets under management is with 20% Mutual funds. 80% of the good returns we get is from 20% of good investments we make or 20% good decisions that we took. 80% of the money lost or opportunities lost are result of the 20% small things we didn’t took care of. 80% of the money we could have made in Stock markets are due to those 20% of the times we didn’t take risk. 80% of the Financial Planning clients are handled by 20% Financial planners (individual or companies) in India. If finding the best plan (term plan , ULIP , or any other product) was so easy and clear , why is there so much competition and confusion. You have to understand the real goal of financial planning first and then identify the areas you really need to concentrate on . Comments , please share your views about 80:20 rule . Can you give some other real life example ? Looking for some pension plan …. Please dont take any ULIP for grandfather .. the better things would be senior citizen saving account and MIP (Debt) , this would give a better risk adjusted income to him . Dont go with traditional plans . A very educative article but lot of people have down to the wire to and commented a lot about using 80 – 20. Thanks for the comment , true that little efforts result in the majority part of acheivement , now its upto us that we dont to get that extra 20% by putting another 80% . 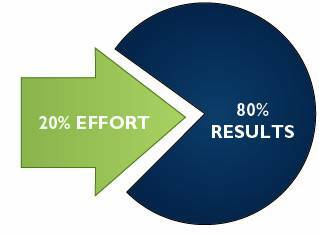 80% of marks can be scored by 20% of effort. at my age of 54 i m under insured by 40 lacs as per various advises. i have corpus of 10 lacs in various funds,equities and fd. what is the suggestion to get minimum 25000 pm at 60 putting altogether including 15lac retiring benefits?shall i take term insurence, put elss-ulip,pension funds etc? Getting 25000 per month (after tax) can be acheived using around 40-45 lacs . Considering that you have 15 lacs of retiral beniefits , you have 6 yrs in hand and you have to grow 10 lacs into 25 lacs . thats not easy . thats 17% return CAGR . Not that its not possible , but its definately not safe . I would say try to take less risk and settle with 10% return in this age . Invest in couple of Debt oriented Mutual funds + PPF (incase its going to mature by your are retired or you are already retired) and some part in pure equity , this alone can give you around 11-12% , but you can assume 10% to be safe . That will leave you with 32 lacs of retirement lumpsum and close to 18,000 month income , now either you have this choice or take more risk and try for 17% return which can be so risky if things go bad that you will have to settle for lesser income like 12-13k also . I was watching ET’s Investors Guide. And a viewer has posted some query on how to get Term insurance.The expert listed down some 3-4 points on hows and haves and haves not of it. I am glad that what ever background work i did prior to taking my term policy, featured in there. And I want to thank Manish for educating me on Term insurance and introducing the split. So Manish thank you so much.!! ET’s Investor’s Guide ! . is it a show or a Book ? any ecopy ? It is weekly programme i think on channel ET. And yes there are at least 15 new friends of mine who are tuned into your blog. They like it. I was checking the forums and found that you have Shield policy for yourself. Did you also split it? No man .. I have not split it .The plan of split is such that I need to take one more . I liked one point from PV Subramanyam’s blog; Write down the Cash Spending cos cash disappears. Why I like it? 1. Disappears is the right word. Cash really does that. 2. logging your expenditure. This is one age old habit which will stand test of time. And I totally agree it. But there are many who laugh at this habit or ignore it or simply REJECT it. Log your expenses guys. It ALWAYS helps! Yes Manish cannot agree any more on this one. The difference between being Rich and wanting to be Rich; is the will to go extra mile and spend time on money before we spend money itself. So a not so rich dhirubhai can build/multiply/scale wealth. Cos he started somewhere and persisted. Hey very interesting article. I never knew about this 80:20 rule. Will google it and get some more info. Also another thing which amazed me was it takes 21 days to form a habit. So if you want to change a habit or form a new one, you have to stick to 21 days rule and it is really difficult, even though 21 days sounds quite easy. Ah.. this is refreshing one. I recalled my participation on a ‘work-smart’ program and how the instructor introduced this 80/20 rule which applies almost to everything in life. thanks for elaborating its usefulness in financial planning. .-= Jagbir´s last blog ..Disable ssl ver 2 in apache for pci compliance =-. Can you give some other example of this 80:20 rule , especially from our domain . What do agree that small things we ignore add up and affect the performance drastically 🙂 ? 20% of employees are responsible for 80% of a company. 20% percent of customers are responsible for 80% of the revenues. 80% of the profits made in your industry are made by 20% of firms. 20% of the world’s population controlling 82.7% of the world’s income. We wear our 20% most favoured clothes about 80% of the time. We spend 80% of the time with 20% of our acquaintances. 20% of the bugs cause 80% of the crashes in software. 20% of the features cause 80% of the usage in software. 80% crime in country is done by 20% of criminals (in big picture). 80% of work in kitchen is done using 20% of vessels. Lastly, don’t think the Pareto Principle means only do 80% of the work needed. It may be true that 80% of a bridge is built in the first 20% of the time, but you still need the rest of the bridge in order for it to work. It may be true that 80% of the Mona Lisa was painted in the first 20% of the time, but it wouldn’t be the masterpiece it is without all the details. The Pareto Principle is an observation, not a law of nature. thanks for the nice list of examples . I agree that rest 80% of the work is important and should be done , but once we complete the first 20% part . The problem is that most of the people ignore 20% part at all . Anyways you have nice points . good work . .-= Mohan´s last blog ..Decoding Financial Advisers – Part 1 =-. Liked this 80/20 Pareto principle. So what do you think which side of 82/20 would this post be (in terms of comments). But anyway I don’t agree totally to 80/20 thing. Take for eg this post- if it falls in top 20% posts which makes 80% of your comments, the other 80% posts have also contributed in its popularity. Similarly in investments its 20% which gives 80% profits is just because you knew that the other 80% was dud or learnt a lesson because of that & then invested in this 20%. So the other 80% has also contributed some way in your profits but probably cannot be quantified. 😀 seems like too much of 80 & 20 in my comments! .-= Amit Kumar´s last blog ..6 Commonly used Financial Calculators =-. 90 trillion – The number of emails sent on the Internet in 2009. and 81% is spam…. nice to see very informative articles. i need to save 1 lac in next 6-7 months for House. Could you pls tell me where should i invest of 15k montly to get good return with moderate risk. I am thinking of top debt MF to invest? Please advise.Thank you. can you take more risk than 10% loosing money ?